There is no crying at G-Fest! 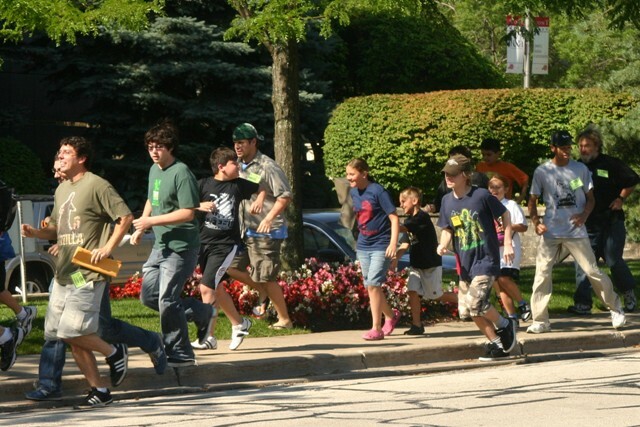 I woke up early on Saturday July 16th and tip-toed around, hoping not to wake the children. My fear was particularly centered around my youngest child, Luke, and that I’d not only wake him, but that he’d invariably ask where I was going. Although it’s not unusual for him to see me leaving early for work each day, the Godzilla shirt I was wearing would not only eliminate that as a possibility but probably give away my actual destination. 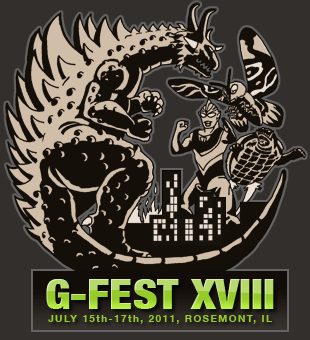 Since 2004 I have, without fail, taken my children to G-Fest (Godzilla Festival) in Chicago. 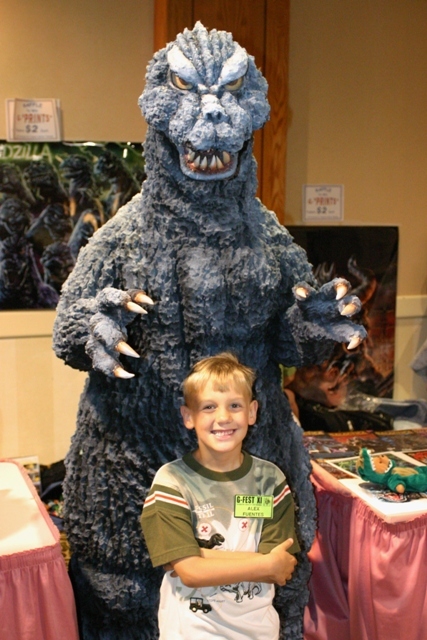 My oldest son, Alex, was 6 years old at the time and was a devout fan of Godzilla (just like his old man) almost since he could talk. In fact, during his kindergarten parent/teacher conference, I recall his shocked teacher showing my wife and I a drawing of the “big G” my son had created along with a perfectly spelled, “I Love Godzilla” written beneath. When I discovered that there was not only an entire convention dedicated to The King of Monsters (as well as all his giant Japanese monster – kaiju -friends and foes) but that it also took place right here in Chicago, I knew that it was one event I could not afford to miss. I had no idea, at the time, just how true this would prove itself to be. 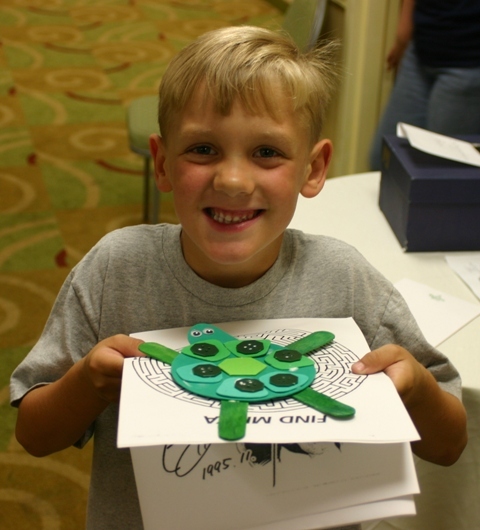 With the perfect combination of children’s activities along with serious forums catered to adult fans, G-Fest is the quintessential “family” convention. In fact, “family” is really a key word here as many of the same fans show up year after year, finally able to walk amongst their peers without feeling like an oddball. 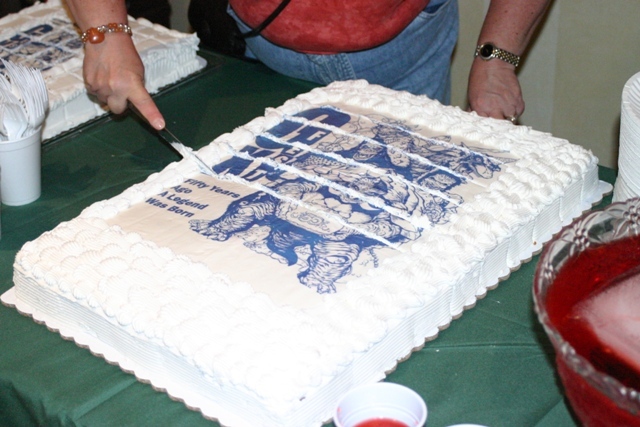 After all the fun we’d end up having at our first G-Fest in 2004 (which celebrated Godzilla’s 50th birthday along with monster-sized birthday cakes to be shared amongst fans), there was never any question that as long as G-Fest returned, we would be there. In fact, in the Fuentes household, it would soon be G-Fest, and not Christmas, for which our children’s impatient lives would revolve. To further enhance the experience, we would always try and get involved in the various fan activities provided; model making, kaiju poetry contest (for which Alex won first prize one year), and the costume contest. G-Fest is one event where the line between adult and child fans becomes nearly non existent as the home made creations of one stands prominently next to the other – regardless of ones level of skill. 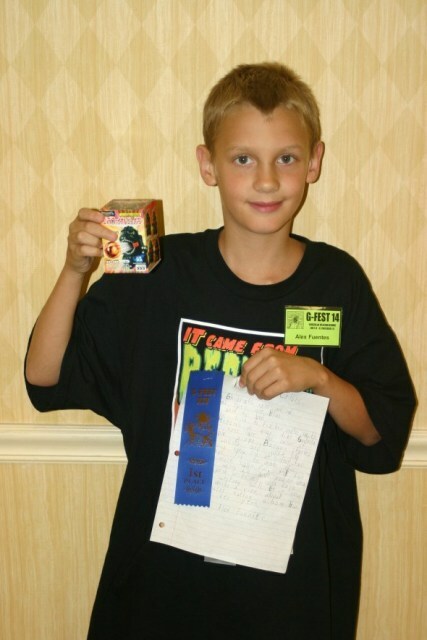 Proudly showing off his prize for best kaiju poem 2007! 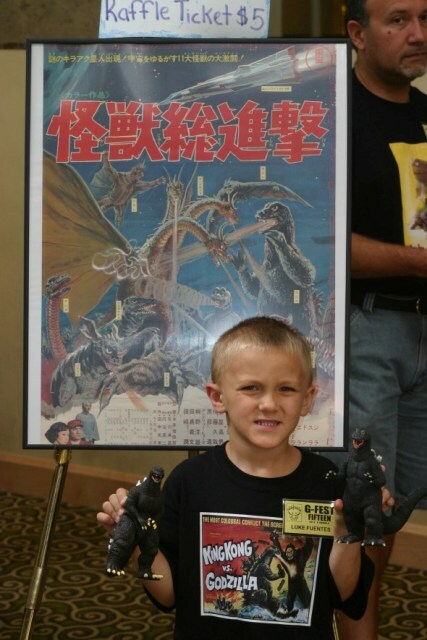 Alex is 13 year old now and, while he still enjoys reading G-Fan, the biggest Godzilla fan in our house has now been passed down to his younger brother, Luke. Shortly after the last G-Fest, this blog-site was born, thus forever changing my approach to fan events (as explained in my recent piece regarding PJ Soles). Having recently attended DAYS OF THE DEAD, and with yet another large event (FRIGHT NIGHT) looming on the calendar, I was unable to spend the customary three days at G-Fest. Instead I decided to devote myself to one day – Saturday only – and to cover the event by myself as a reporter as opposed to participant. After all, I now have a responsibility to our readers to cover as many events as possible and the kids would never sit through all the tedious note-taking and interviewing that would be required of me. It was a decision that will, no doubt, forever haunt me…. I arrived early and, as I exited my van, heard the sounds of screaming along with the patter of running feet. I looked over my shoulder and saw a crowd of delirious G-Fans acting as if they were trying to escape the wrath of a rampaging behemoth. Of course this was the very point of the exercise as, last year, my kids represented a few of those same people. 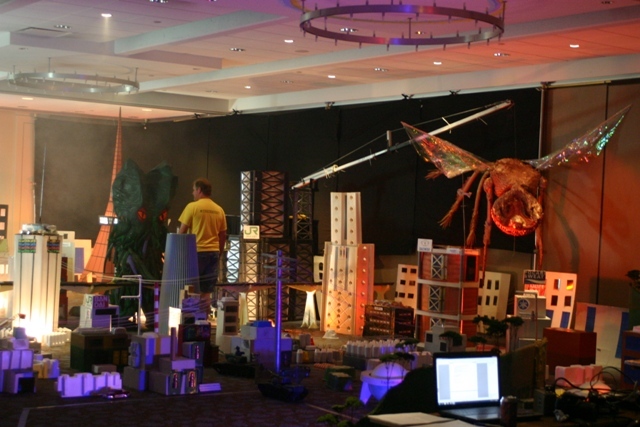 In 2010, G-Fest took their costuming thread to the next level by allowing fans to not only show off their costumes but lumber through a miniature city and duke it out for a fan film. The kids played extras in that film and it was finally to be unveiled this year, just as today’s runners would be featured at the next. 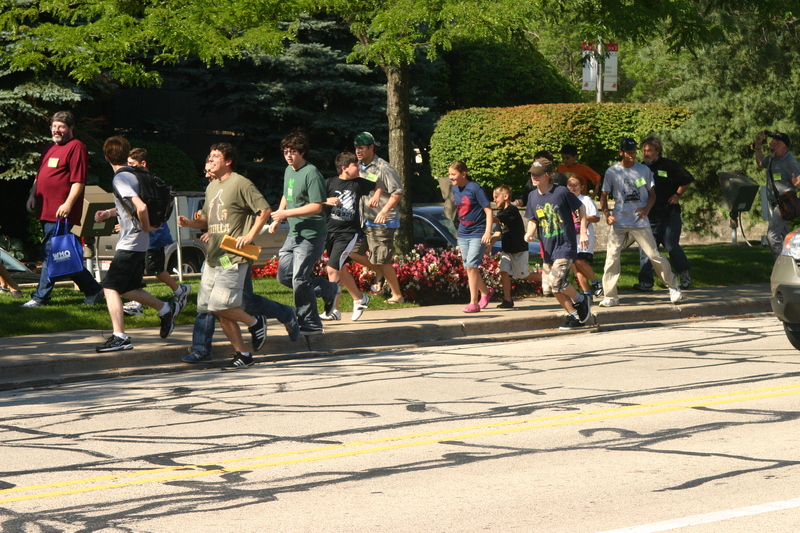 Thrilled that they were not only being directed to run but also to scream their heads off, the kids anxiously awaited the director to yell “Action!” Having not had my coffee yet, I decided that my talents would best be served standing across the street while taking pictures. Later we discovered that my daughter, Leia, should probably avoid a career in acting as the pictures revealed that she was clearly having the time of her life as opposed to running for it. After registering, I had some time to kill before they would open up the dealer’s room, so I decided to sit in on a forum dedicated to kaiju music. This was something I was never able to fully enjoy when I brought along the kids. Sitting on a forum and listening to a bunch of adults hash out the the finer details of their fandom is, from a child’s perspective, no substitute for the numerous crafts and games offered in “Minya’s Place” nor the excitement of playing GODZILLA UNLEASHED with a group of their peers (who unlike the ones back home, actually know all the names of the monsters). I am not a musician but I have to say I found this one to be quite interesting (and I’ll be sharing highlights in a future posting). It soon made me recall the time I quietly watched Alex play with his toy kaijus while applying the appropriate “theme” music to each one. Later I enjoyed perusing all the wonderful monster merchandise in the dealer’s room and paying a visit to Scary Monsters editor, Dennis Druktenis! Dennis was proudly speaking of his children which got me, once again, to start thinking about mine and how much Luke loved walking around the dealers room at G-Fest. I remembered the first time he entered the room – his eyes becoming as wide as Charlie Bucket’s when first gazing at the main room in Wonka’s chocolate factory. My favorite aspect of this event is the model room and I am always so impressed with many of the talented entries that come in each year. The amount of skill and creativity really shines through and I believe I may have to post a future blog simply highlighting some examples. Just amazing! On my way to the model room, I passed “Minya’s Place.” This was, of course, a room that I’d spent a lot time in during past G-Fests. It’s where my son made me a “Gamera” utilizing green foam and tongue depressors. Although it has since lost one of its eyeballs, I still proudly hang it over my desk at work. This was also the room where my daughter, Jade, made herself a Mothra hat that could often be seen adorning her head the remainder of that particular summer. Yessiree, lots of amazing crafts & memories were made in this room. I gave it a very brief glance before happily moving past it. The video gaming room and fan art gallery didn’t help much either (did they have to put the model room at the far end of this event, making me pass all these darn rooms!?). My boys consider themselves to be true champions of kaiju video gaming and I remember the look of pure pride that came across Luke’s face 2 years ago when, at four years old, he managed to conquer a 12 year old in the G-Fest game room while using one of his favored (and often dismissed) monsters, Baragon. 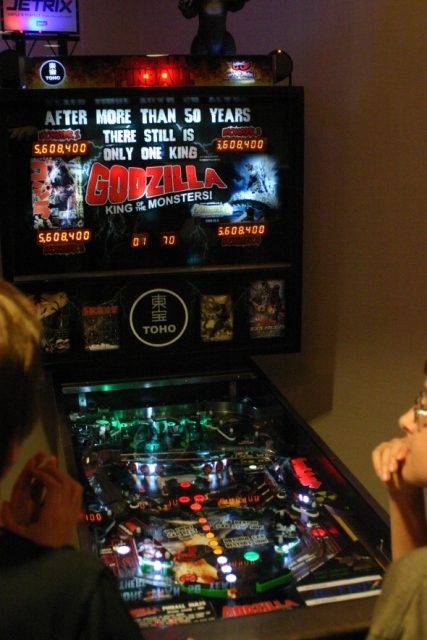 This year the convention gods took pity on me by showcasing an amazing home-made pinball machine dedicated to Godzilla. This made it much easier to divert my attention away from the group of cheering kids – but not long enough to miss one that looked a bit like Luke. FINALLY I arrived in the model room and immersed myself in the amazing sites. I was really allowing myself to enjoy the moment when I spied a smaller entry sitting innocently amid the larger and more elaborate ones. 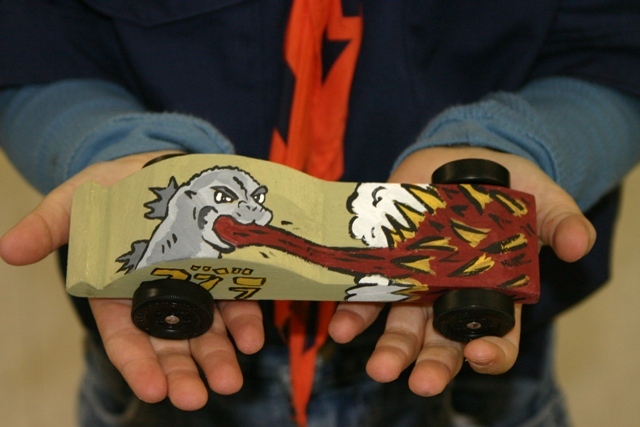 There sat a Godzilla inspired Pinewood Derby car that some child made for the climactic Cub Scout event that had, not doubt, taken place this past winter. While the design was original, I knew that the concept was not. In 2005, I remember working on a Godzilla inspired derby car with Alex, holding his little hands as we guided the paint brush over my cartoon sketch. Having spent more time on ascetics as opposed to functionality, the car managed to come in last at every race it was in. Alex didn’t care – in his eyes it was still the coolest car in the competition. Thankfully, it wasn’t that long after this that my friends, the Count and Countess Gregula, arrived to provide suitable distraction. In fact, after DAYS OF THE DEAD (once again I direct your attention to the PJ Soles post) I am beginning to think that the Gregulas true calling in life is to prevent me from becoming despondent at fan events! Their presence did help a lot in that regard although even the most amusing conventioneer wasn’t going to keep me focused during G-Fest’s annual grand finale – the costume parade! During this event I was inundated with a flood of memories at my various, and often disastrous, attempts at costume making. 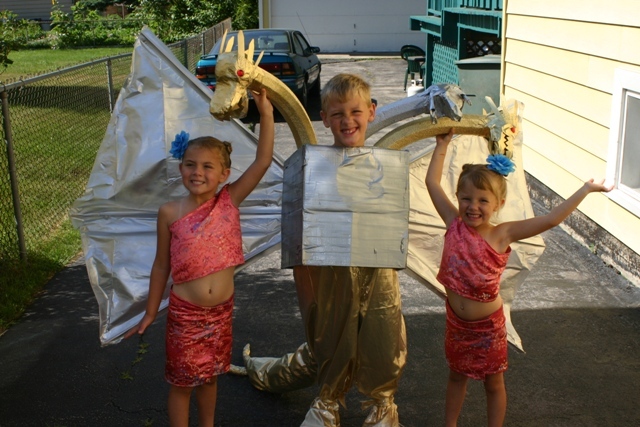 Particularly the time I took on the insurmountable task of making Alex into Mech-King Ghidorah! I spray-painted a bunch of foam water sticks to use as the necks which, upon applying some paper mache heads, soon became too heavy to stand up. Further adding to the dilemma, Alex became too hot while waiting for his turn to march that he promptly vomited all over it just as his name was called. Gregula brought his video camera and, in an effort to amuse myself, I pretended to be narrating a kaiju “fashion show” during its duration. My “tears of a clown” strategy worked at least long enough to get through what would otherwise have been an unbearable experience. 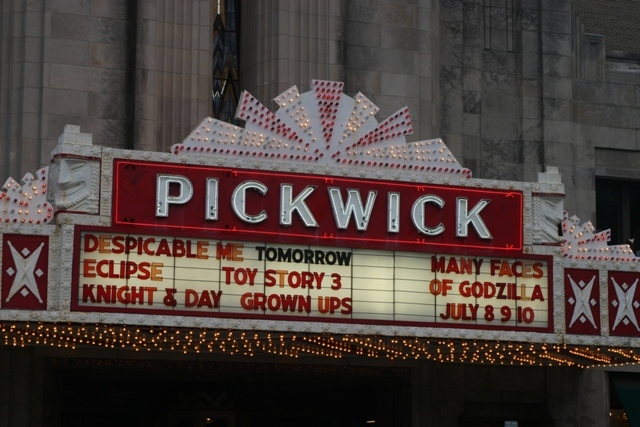 My intention was to leave right after but, just as my kids had in previous years, the car-less Gregulas managed to talk me into taking them to the movie featured late that night at the nearby Pickwick Theater. And, just as ALL my kids have done at EVERY Saturday night G-Film, managed to fall asleep before the film’s second act – leaving me to enjoy the movie alone. This entry was posted in Atomic Monsters!, Convention & Expos and tagged Bandai, Cub Scouts, DAYS OF THE DEAD, FRIGHT NIGHT FILM FEST, G-Fest, Gamera, Godzilla, Godzilla Pinball, Godzilla Unleashed, Hedorah, Mecha King Ghidorah, The Pinewood Derby, The Smog Monster. Bookmark the permalink. ← Chicken Soup for the P.J. Soles!